The VaxArray Influenza Pandemic Hemagglutinin Potency test is a simple multiplexed sandwich immunoassay that accurately quantifies HA protein from the most recent pre-pandemic and zoonotic influenza viruses. Subtype specific antibodies for A(H5), A(H7), and A(H9) influenza strains can quantify HA through all stages of vaccine manufacturing, including in low-dose adjuvanted formulations. The VaxArray® Influenza Pandemic HA Potency Test Kit contains 32 microarrays and most of the reagents needed to quantify H5, H7, and H9 HA in crude samples or final vaccine formulations. The test is a based on a multiplexed immunoassay in which a panel of monoclonal antibodies is used to capture subtype-specific antigen. Readout is based on fluorescence from an antigen-specific antibody that is conjugated with a proprietary fluorophore. The arrangement of monoclonal capture antibodies within each microarray (i.e., within each well) is shown in the figure below. Equivalence to SRID. When calibrated appropriately VaxArray exhibits equivalence to SRID for monovalent and multivalent vaccines. VaxArray enables rapid quantification of hemagglutinin throughout the manufacturing process without changing methods along the way. Subtype Specific and Multiplexed. Quantify monovalent or all components of a quadrivalent formulation. The microarray utilizes multiple antibodies for each subtype with 9 replicates per antibody in a single test. This provides high confidence in results for protein quantification. Stability Indicating. As an immunoassay, VaxArray Influenza measures biologically relevant forms of HA. Compatibility with Adjuvants. HA quantification is unaffected by the presence of adjuvant at dose-sparing concentrations. Off the Shelf Kit. Eliminates need for in-house preparation of plates or gels; streamlines testing (time to result is less than 2hrs) and can be used with or without standardized reagents. VaxArray users must select and order the appropriate fluor-tagged label antibody from the range offered by InDevR (see below for the anti-HA mAb list). In general, for egg-propagated flu vaccines we recommend the nearly universal polyclonal antibody (VXI-7601) for ease of use and broad applicability. For cell-propagated flu vaccines, recombinant proteins, or virus-like particles, it is recommend that you review the Label Selection Guide or, better yet, speak with our scientists about which label antibodies to try. It is sometimes necessary to experimentally evaluate a panel of label antibodies in order to optimize sensitivity. 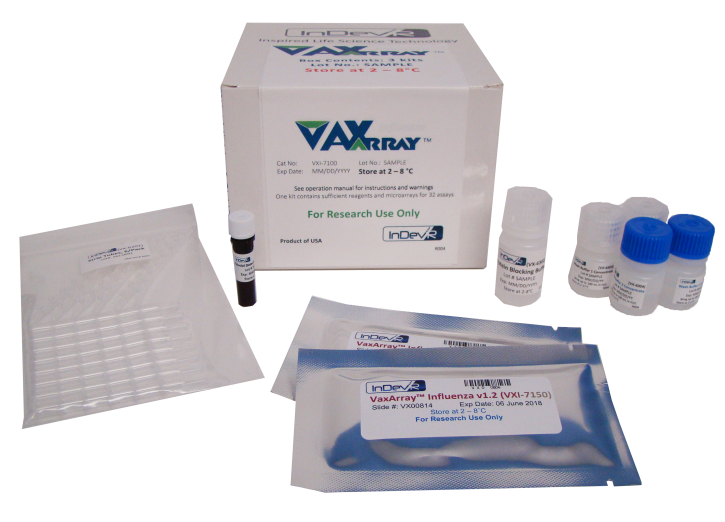 The VaxArray Pandemic HA kit is manufactured under cGMP conditions within ISO 13485:2003 certified facilities. Q1) Are the antibodies of the VaxArray Influenza Seasonal Hemagglutinin Potency Test Kit sufficiently broadly reactive to detect the targeted HA in the event of antigenic drift? A1) Yes. The VaxArray Influenza Seasonal Hemagglutinin Potency Test Kit’s panel of antibodies have demonstrated broad coverage of historical vaccines dating back over 15 years (Kuck, 2014). However, because future antigenic drift is difficult to predict, InDevR has developed a process for evaluating assay performance against novel influenza strains. Through close collaboration government agencies we will screen against emerging strains and if needed, efficiently evaluate new antibodies and update the assay as needed. Q2) How does InDevR ensure that the reagent kit is suitable for the seasonal strains chosen by the WHO in February of each year? A2: InDevR has developed a process for evaluating the assay and reagents performance against any new strains suggested by the WHO. In the event that a new strain performs poorly with the current set of reagents, InDevR rapidly screens alternative antibody and reagent options for the best replacement. The reagent kit will be updated and qualified accordingly. Q3) What are the characteristics of each antibody in terms of origin, epitope detected, etc.? A3) Below is a detailed array table that summarizes relevant information for each antibody. 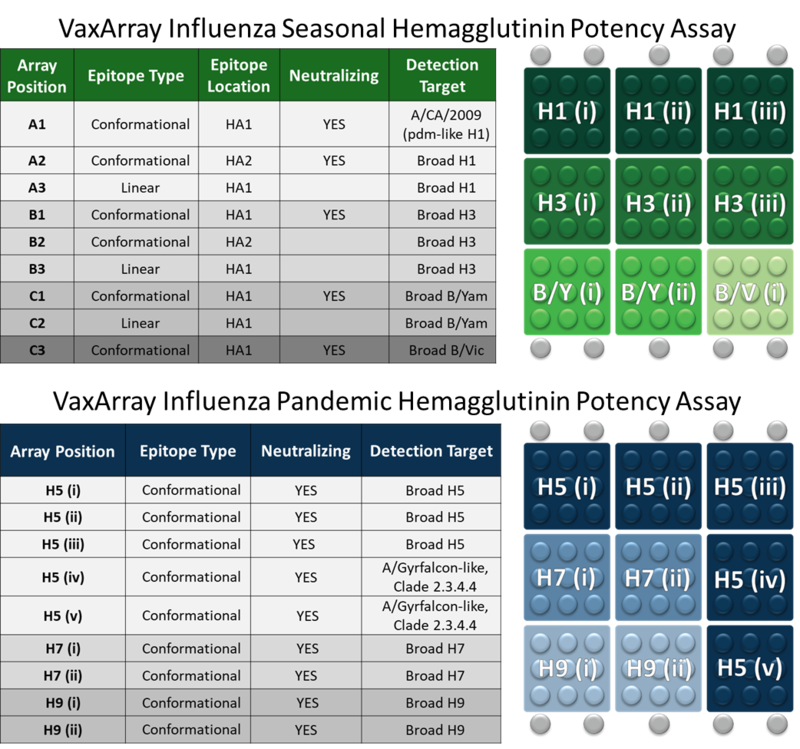 These tables describe the conformation type detected (linear vs. conformational), the general binding location (if known), and the detection target(s) of the antibody. We hold all other information as proprietary. Q4) Is the label antibody a monoclonal or polyclonal antibody? A4) InDevR offers a number of label antibody options. The most popular is a “universal” polyclonal label but multiple monoclonal labels are also available for greater sensitivity to protein structure. Please refer to the Label Selection Guide for more information on which label antibody is best for your needs. Q5) How do I determine which label antibody I should use? A5) Please refer to the Label Selection Guide for more information on which label antibody is best for your sample and needs. The team of InDevR scientists will also be happy to help you to select the appropriate antibody for your specific sample and analysis needs. The polyclonal label is the most flexible and is appropriate for most samples, while the monoclonal labels tend to be more sensitive to protein structure and provide better coverage for some sample types, such as recombinant proteins. Q6) Why is the VaxArray assay so sensitive considering the usually high concentration of HA in vaccine production? A6) This is just the nature of the assay. High sensitivity provides a significant benefit to the assay as it allows for large dilution into our high performance Protein Blocking Buffer. Large dilution factors help reduce the amount of sample required, while also diluting out interfering agents such as crude matrix proteins, sucrose, and adjuvants. Unlike SRID, which does not function well with these interfering agents, the VaxArray assay is capable of quantifying HA from all steps of the production process. Q7) Why is Zwittergent used in the first stage of sample processing? For most ELISA methods it is not required. A7) Zwittergent is the detergent most commonly used for SRID analysis. We have adapted this to our assay to ensure that the structure of HA (trimer, oligomer, etc.) 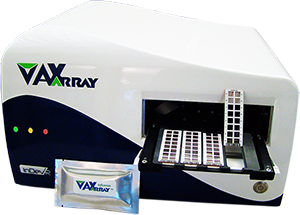 analyzed by SRID is also being analyzed by the VaxArray assay. Q8) Can the VaxArray assay be used to quantify HA from live, active virus? A8) Yes. The initial step of the assay is to lyse the sample with Zwittergent which is generally considered to split 100% of whole virions. At this point, the sample can usually be analyzed on the benchtop. 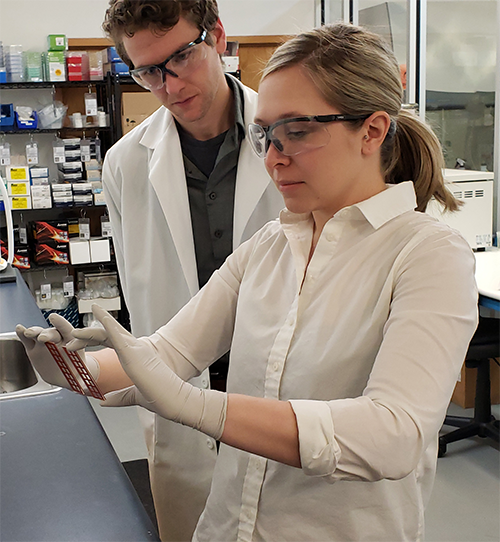 The high sensitivity of the assay also allows for the dilution of interfering agents such as allantoic proteins, sucrose, and cell-culture media. Q9) Which reference antigen should I choose for my analysis? A9) As with SRID analysis, the sample and standard should be matched strains. We have shown that not all reference antigens are the same and have some preliminary evidence that BPL-inactivated reference antigens are more appropriate than formaldehyde-inactivated reference antigens. As a rule, each laboratory should investigate this and determine which standard is most appropriate for their needs. Q10) Can I use an internal standard for VaxArray? A10) Yes! Internal standards work very well in our assay as inactivation conditions are usually well matched between internal standards and sample. Q11) How do I gather and analyze the data from the slide after processing? A11) InDevR has developed a VaxArray specific software package that is loaded onto the VaxArray Imaging System. This intuitive software package will walk you through the set-up, imaging, and analysis of data. Results are presented in easy to understand reports. Q12) How can I know that the VaxArray assay is appropriate for my samples? A12) The VaxArray science team is here for you! Our team of expert scientists will discuss your sample and analysis needs with you to determine the best course of action.